Kenya is a third world country and as such there are quite many places outside the major towns where infrastructure and resources are either in limited capacity or absent. This is the same in many places across Africa. This situation demands special solutions that are specifically developed for these places. Solar powered internet schools thus serve as one of the solutions that are standalone and won’t rely on infrastructure like physical buildings, electricity grid or cable Internet connections to work. These are set up in 40 foot shipping containers that have a smart-board, laptops or docked tablets, printer, solar panels that are connected to a battery pack and inverter, and server setup. Read more on the Internet Schools setup here. The advantage these present is that they can work as a standalone fully, and actually become a resource to the community around. The one set up in Arap Moi Primary School serves the students in the school and at the same time is used by the community in the weekends to train them on various skills. Example is training of expectant mothers on maternal health-care. The Internet School is set up with a Learning Management Software by Intel that enables the teacher interact with the students on their computers. This includes being able to control individual screens of the students. The learning software makes learning easier in that the teacher is able to do better demonstration with visuals and can even write on the smartboard and broadcast the screen to students, essentially making all students participate. “Teachers battle with students attention, and the solar powered internet schools make it easy for the teacher to control student attention making teaching easier,” said Robert Ngeru, Samsung Electronics East Africa Vice President. The teacher is then able to much more than just teach in that they can choose to print students work for marking or even mark the work from the individual computers. The server serves as central storage so the work is available centrally. Other advantages are that the teacher can have a pre-recorded lesson and have another “guardian” teacher come in for them if they are absent. 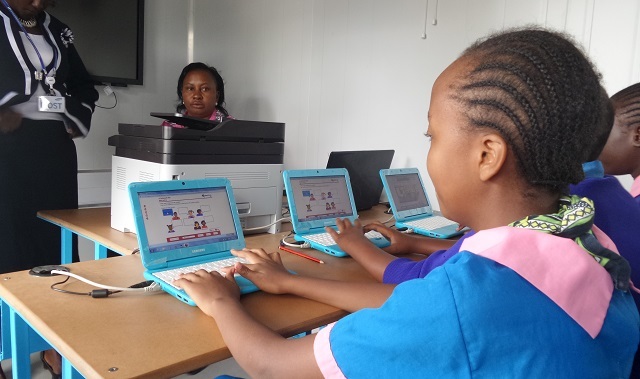 The internet school is also equipped with an internet connection by whatever best internet connection is available, for this one they did Safaricom WIMAX, and students are able to use the internet for further research. The internet set up also boosts the 3G signal hence it also improves the mobile phone connection for the community. Safaricom has provided this free for 5 years. This is an obvious question one would ask, how do they handle the situation created by the business decision to drop entry level laptops and focus more on tablets. According to Robert, other set ups within the country will be done on tablets. “We are going to implement future set ups with tablets that have docked keyboards instead, and we already have the training software customized to work with the tablets,” commented Robert. Samsung goes ahead and trains the teachers to manage the teaching well and has sent two teachers to South Korea to train them on managing the training content.